Pro-Fusion Protein blend of Albumen (100% pure Egg white) and 100 % pure Whey ISOLATE, the two best source of protein. A "time release" protein formula with Whey Isolate showing anti-catabolic effect when needed the most after intense exercise and Pro-anabolic effect because of prolonged action of Albumen (Egg white). 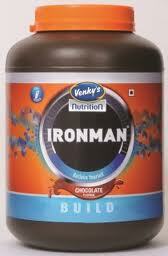 Unbelievable price on Venkys ironman in Mumbai (India) company Euphoria Healthcare Pvt. Ltd..